Wow!! Bless your heart. I have been very fortunate to have been able to reduce the severity of my daily migraine attacks after a 2-year stint of Botox injections. I have been off the injections for a year this coming September. Now I am just taking tramadol 3 to 4 times a day and 50mg of topiramate at bedtime. I still have headaches, but they are about a 2-3 out of 10 where they used to be a 6-7 out of 10 every day with some attacks being worse and sending me to the emergency department. I look forward to hearing an update on your situation. Sending good thought clouds your way. Lynn, so glad to hear you’re doing better. And thanks for the kind words. I’m intrigued that you’ve stopped Botox, but your doctor is still OK with you being on Tramadol. Do you mind telling me the reasoning? I’m not questioning you our your doctor, but it’s an unusual decision and am curious to know what’s behind it. No problem with asking. I also suffer with fibromyalgia. The tramadol has helped with the body aches and leg pains, as well as some of the headache pain. Lynn, thanks. That makes total sense. Thank you for sharing this chapter in your story. I’ve taken triptan acute medication about twice a day for over a decade. I’m in the midst of a triptan detox, 14 weeks and counting. Over the past couple years, I detoxed once for 8 weeks and once for 5 weeks. As my headache specialist warned…relapse is very very common. I wonder how long you hope to stay off the acute medication. Where I live, hospitalization support is not even an option, so toughing it out at home is what I can do. The first week is pretty brutal, but after that things improved. I took anti-nausea meds so I wouldn’t get dehydrated from vomiting. I have had support from my osteopath and also started taking Nabilone (Cesamet) to help with the detox. I am delighted (and still a bit shocked) to report that some of my headaches now only last an hour or two and then go away on their own. When they really take hold, it is a 24 – 48 hour experience, and that happens about once a week. A huge improvement!! Life is more complicated to plan, because I am not making myself able to function by taking the triptans. A bad migraine pops up out of the blue and everything on the schedule gets canceled. But the fact that there are days WITHOUT headaches feels like an absolute miracle. A long way to go, but detoxing has been really important. I hope you find some relief once you get through the initial withdrawal. I really really hope some days are better for you. Thank you for the support your blog provides. I’m very appreciative. Newfoundler, thanks for the support. I’m sorry you’ve had to go through this ordeal so many times. How long does your doctor want you to stay of triptans for? I’m not sure how long I’ll stay off the acute meds. My specialist was fine with me staying on them since they enable me to function. If I go two weeks without and am nonfunctional, I will likely go back on them. That said, I’m doing remarkably well right now. Monday was bad, but Tuesday was better than Monday, and today is better than Tuesday. It could just be a fluke, but I’m hopeful it’s more than that. Wishing you well on as you are off your rescue drugs. So sorry that eating is a trigger for you. Has to be one of the worst triggers imaginable. My biggest complaint as a person with chronic migraine and who has had MOH 3 times, is the lack of treatment for those of us with #chronic #migraine. Just this morning I was thinking about my out of control to do list and the deterioration of organization in my house and projects left undone. I can only keep on doing my best but I feel bad b/c I know I am falling short. Thanks so much for your blog. It has been a source of support and inspiration for years. infiniteknot, thank you so much for the kind words and support. I so know what you mean about feeling like you’re falling short. I won’t give you a pep talk, but want you to know you’re not alone in that feeling. Sometimes I feel like the problem is that we have so many potential treatments, but so few good ones. After the handful of preferred treatments, there are literally 100 treatments that might (or might not) work. My fingers are crossed that the CGRP drugs pan out to be as good as they seem. Kerrie, thank you for providing us with an information trove in order to be proactive with our health needs. I’m curious about the oxytocin that you were taking, such as form and dosage. I’m in the process of revisiting a functional medicine doctor who seems the most likely to prescribe it for migraine as Oregon no longer has a headache specialist. Tracy, it’s a nasal spray. The dosage is listed as 10 units/ml. I did one spray in each nostril once a day. Has Christina Peterson closed her practice? The oxytocin nasal spray is in the mail, so hopefully I will have some success. Although I haven’t seen her, thank you for pointing me in the direction of Dr. Christina Peterson. She wasn’t on my radar or the radar of my multitude of doctors. I just started using oxytocin nasal spray so searchedyour blog to see if you’d written of it before. I don’t want to get too excited yet, but I’ve been on it for 4 days shy of 1 month & my medication use has decreased along with my migraine frequency! I started it June 23, 2017. Jun1-19 I had taken 11 sumatriptan (a particularly bad month). July 1-19 I’ve only taken it 2x!! My Dr has me taking it 3x/day 2 sprays in each nostril. In the last 3 weeks I weaned off 1 preventative (imipramine) & started taking another (amitriptyline). So needless to say I’m shocked I didn’t get worse! Miss your blog updates!! Hope you’re well & loving your life free of migraines!! This is an old post but I am going off my medications starting tomorrow. I have been in an overuse cycle for years and finally have the courage and the opportunity to sit through the discomfort and do the diet at the same time. Can you tell me if the detox has worked for you and how if possible I can avoid having to do this more than once?? Hi Jennifer, I hope the detox is going well for you. It did work for me. I had another treatment in place (the gammaCore) that is helpful for me, so I was able to avoid medication overuse again by using it instead. I know that’s not an ideal answer if you don’t already have another treatment in place. The good news is that other that were once ineffective often work once a person is out of medication overuse. (The gammaCore became more effective for me after I detoxed.) Best wishes on your detox and search for relief. I’m trying to detox from MOH of Maxalt. 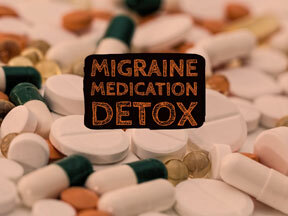 I have been getting 10 migraines a month with lingering headaches between each migraine. Sometimes I took two Maxalt a day. My doctor gave me a steroid pack for a few days, magnesium IV and botox. During the pack, I felt out of it but did not get a migraine. Now I am on my 4th day of a horrible extended migraine, difficulty with sleep and not knowing when this will end. I’ve gone this far and don’t want to give up and take a Maxalt. I’m wondering if it is ok to take a Benadryl tonight. If it doesn’t end soon, I don’t know if I should go to the emergency room or what? Any advice? I’ve enjoyed your posts, especially since I’d had so much trouble finding info on triptan rebound headaches. Anyway, I suspected I was having rebound or MOH from eletriptan as my dosage was up to almost daily. Today is day 4 without it & although I’m feeling a tad better, it’s not great. I really haven’t had a bad headache, but the nausea and fatigue have been unbearable. Since I’m doing this on my own, I have 2 questions. First, how long will withdrawal symptoms persist? Second, how long until I can go back to using the triptan a couple time’s a week without getting back into the overuse syndrome. Any advice would be appreciated. Best of luck to you, as well. Hi Jules, I’m sorry you have to go through medication withdrawal, though happy to hear you’re doing a bit better. The answer to your questions is person-dependent. It depends partially on how long you’ve been taking the medication and at what doses (generally it’s easier the less time you’ve been on the medication and the lower the dose), but each person is different even given those parameters. Same goes for returning to medications. Some people can return in a couple months without issue. I’ve been able to return to using naproxen, but I can’t take more than two doses in 10 days without feeling worse. I tried a triptan without success about six weeks after I detoxed and haven’t tried again. I haven’t tested it again because I’m using the gammaCore, which replaces the need for triptans for me. Best of luck in your detox. Thanks for your encouragement, Kerrie. I’m feeling much better, as I wasn’t overusing triptans for too long. So far, headaches have been better, but I dread the day I have a “need triptan” day, but can’t use it. Could you elaborate on GammaCore? There’s no hurry, just whenever you feel up to it. This is a treatment with which I’m unfamiliar.